Every now and then on the blog, I like to do what I call an entrepreneur spotlight. I love talking to other entrepreneurs, especially women entrepreneurs, and learning how they overcame obstacles to build their businesses. Today, I’m sharing an interview I did with Shannon McLay, a financial expert who hosts an award winning podcast called Martinis and Your Money. Shannon has expanded her business to include a brick and mortar location. Read on about how she’s changing the money landscape in New York City. I met Shannon McLay a few years ago, first online through our blogs and then in person. I wrote on my blog that I was moving all the way from Louisiana to New Jersey, and she reached out to find out where. Coincidentally, I moved only 40 minutes from her house, so she came over to my apartment armed with casseroles and delicious smelling candles to help me ease into my new life as a mom of twins who just moved across the country. 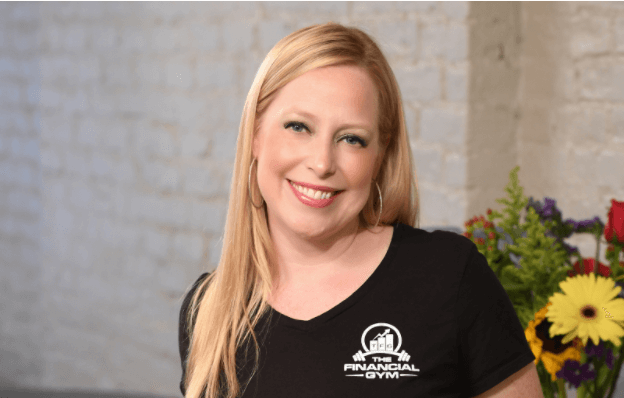 From the first time I met Shannon, she told me about her idea for The Financial Gym, a place where the average person could go to get money advice without worrying about having a gazillion dollars to invest. I watched The Financial Gym go from just a concept to an actual reality. A few weeks ago I walked down 5th Avenue in New York City and passed by her first brick and mortar location. It took a lot of time and hustle, but The Financial Gym is now a real living and breathing company in one of the biggest cities in the world. Below is Shannon’s story on how she made this dream become a reality. I hope you enjoy my interview with her and that you find some inspiration from it. Hi Shannon! First, could you please tell me a little bit about your background as a financial expert? What types of jobs have you held in the financial sector? I worked for 13 years in various areas of the financial services industry including investment banking, institutional fixed income sales, hedge fund sales and management, and financial advisory. Three years ago I left the traditional financial services world and started my company, The Financial Gym, which provides financial planning and guidance for people of all ages and financial types. Working for large financial companies is undoubtably a lucrative career choice, especially as you advance over the years. What made you want to quit working in corporate finance and start your own company? When you work for a large financial services company, you ultimately end up in a box; and over time it becomes increasingly more difficult to break free of your box and try a new box on for size. For example, I worked in the commercial bank at Bank of America and helped mid to large sized companies manage their cash investments. I was paid well for the job that I did, but I didn’t have the opportunity in the bank to do something different. There are so many specialized jobs like this within a large organization, and many people spend their whole careers working in them. I didn’t want to have a career stuck in a box, especially because there was always the possibility that the bank could get rid of the box at any time, and I would not be prepared for another job. Despite not wanting to be stuck in one spot with a large organization, I also saw a need for a different kind of financial services, and my passion for helping others moved me to make the leap and start my own company. How did the idea for the Financial Gym come about? While I was working as a financial advisor at Merrill Lynch, I met a number of people who didn’t have $250,000 in assets, but wanted to pay for personalized help from a person and not a website or an app. I didn’t have a means to assist them while I was at Merrill, but I put together plans for them on the side. After one meeting where I presented a basic financial plan to one of these pro-bono clients, she looked me in the eyes and said “You know you’re saving my life right?” In that moment, I knew that I needed to leave Merrill Lynch and start a company for people like her. Every financial services company wants to work with people with wealth; however, no one wants to help people who are starting out and trying to build wealth and pay down debts. Around this same time, I had just recently lost 50 pounds between dieting and working out, and I remember thinking that there were plenty of places for me to go to get physically healthy, but if I wanted to get financially healthy, my options were severely limited. I had the vision of the financial gym as the place that people could go to get financially healthy, and I always imagined financial gyms across the country where people could go no matter what their financial body type looks like. It took you a few years before you opened up your first physical location for the Financial Gym. What hurdles did you encounter going from idea conception to brick and mortar business? In the financial services startup world, 100% of venture capital money goes to fintech companies. Actually a large majority of early seed start up funds are focused on technology solutions; therefore, I had to get creative with my fundraising and really dig deep into my network to find people who believed in the concept and my vision. Even today as we are planning the next round of growth, it’s difficult to find the right investors given the fact that our business model is completely unique. Venture capital investors love to follow patterns (look how many apps there are out there) and very few like to help companies create new patterns. In addition to my unique business model, I am also a female founder and only 7% of female founded businesses actually receive venture capital funding. Despite these headwinds, our business continues to grow and we are changing the financial lives of hundreds of people everyday. One day, the VC’s will catch up. Who is the Financial Gym for? What can people expect to learn when they visit the gym? The Financial Gym is for anyone looking for personalized help with their money. Our typical clients have all tried the apps like Mint.com, YNAB, Betterment and realized that they only solved part of the problem and that they needed someone to look at the whole picture and put the pieces together for them. Not only that, but they also need the accountability to stay on track to achieve their financial goals. When people visit the financial gym, they can expect a comfortable and friendly environment where they can feel free to share their money stories and know that a financial trainer will not only help them, but will also care about their journey. Traditional gyms have barbells and treadmills, and we have kleenex and wine. We understand that personal finance is personal and dealing with money is often emotional and creates great anxiety. We don’t want our clients to stress about their money; we want to empower them and help them achieve the goals they never dreamed possible. We see it every day at the gym. What do you think is the biggest struggle for the average person when it comes to their personal finances? Or, what seems to be the most common problem you encounter with your gym clients? We have a tracking system like Mint.com, and we help our clients not only figure out where their money is going, but also how they can successfully prevent it from leaving or at least not wasting it on expenses that are not important to their overall goals. What advice would you give to an entrepreneur who is trying to make their business goals a reality? What are some of the problems they should watch out for in their entrepreneurial journeys? I think that before you pursue an entrepreneurial endeavor, you need to make sure that you are filled with not only passion but as many financial resources as you can secure. Even the greatest ideas will take time to develop, and the financial resources will help sustain you on that journey and your passion will fuel you through all of the rejection you will face because it’s inevitable that not everyone will love your vision. As long as you have the passion and the funds, though, you will get your business to the place you want it to go. What are your plans for the future of the Financial Gym? This year we plan to hire new financial trainers, invest in marketing, and expand to other locations. My vision is to have financial gyms across the country and to-date we are just located in New York City and work with people remotely. Soon people will be able to walk into a financial gym in their neighborhood. Where can people learn more about the Financial Gym? People can find out more about the financial gym at our website. They can also follow us on Facebook, Twitter, and Instagram under the Financial Gym and hear more about it on my podcast, Martinis and Your Money on iTunes. Thank you, Shannon, for your time! I am rooting for your success! Cat’s coaching has been immensely helpful… In the three months since working with her, I’ve booked business worth 130% of the cost of her coaching. This is a skill I’ll be able to use to make money for a lifetime… I’m excited about the future of my business!